This husband & wife duo uses classical and electric instruments to create a lively concert format with many styles of music. 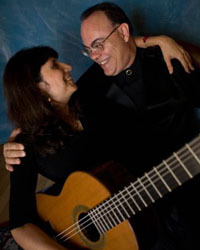 The duo has been featured on television and radio broadcasts in the Phoenix area, performed and recorded with the Phoenix Symphony Orchestra, and played with Dave Brubeck in his "Fiesta de la Posada" Christmas cantata. They are talent personified.